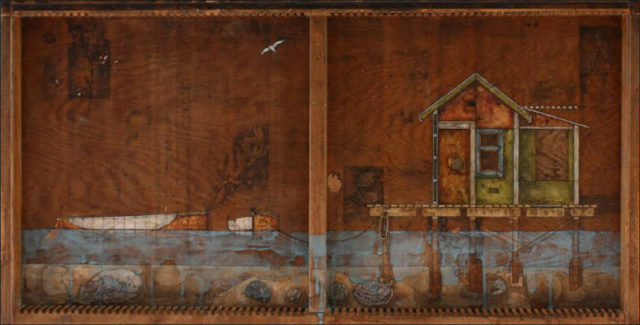 The inspiration for this work came whilst sketching the boat sheds in Mana near Wellington, New Zealand. I had already collected many plants, shells and stones from the area, and housed them carefully in my printing press drawer. I started painting directly onto the drawer, collaging illustrations of my collected specimens and developing an imaginary boat shed based on my initial sketches. The resulting piece materialised as I worked. The old chain (rope) belongs to my husband’s Grandmother, who has lived in Plimmerton for many years. One of the boatsheds was (up until recently) owned by her family and the chain represents this connection to the area.